growing demand of sophisticated multicolor analysis. by Miltenyi Biotec. VioBlue®, VioGreen™, VioBright™ FITC, PE-Vio® 615, PE-Vio 770, PerCP-Vio 700, Vio 515, VioBright 515, APC-Vio 770 are characterized by high fluorescence intensities and low spillover, making them an ideal choice for multicolor applications. Combined with traditional fluorochromes, such as FITC, PE, PerCP, and APC, the Vio Dyes expand Miltenyi Biotec’s antibody portfolio and allow a greater selection of antibodies for multiparameter cell analysis. The VioBlue® Dye is a coumarin-based fluorochrome with excitation and emission wavelengths of 400 nm and 455 nm, respectively. It is a superior alternative to Pacific Blue™, Alexa Fluor® 405, or BD™ Horizon™ V450. Multiplexing of VioBlue with other fluorochromes is easily possible, adding to the variety of marker combination for multiparameter flow cytometry. 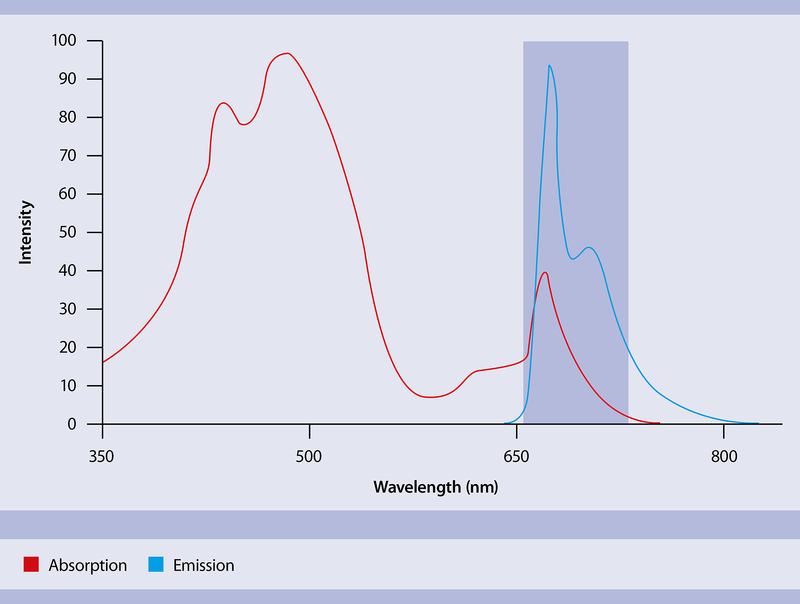 Designed to maximize the potential of a flow cytometer’s violet laser, the VioBlue Dye shows superior performance compared with many other fluorochromes excited at 405 nm, including significant advances in brightness, signal-to-noise ratios, and intralaser compensation requirements. In addition, VioBlue exhibits minimal photo-induced degradation, and can consequently be used for many different applications, such as fluorescence microscopy. Absorption and emission maxima of fluorochromes related to VioBlue. 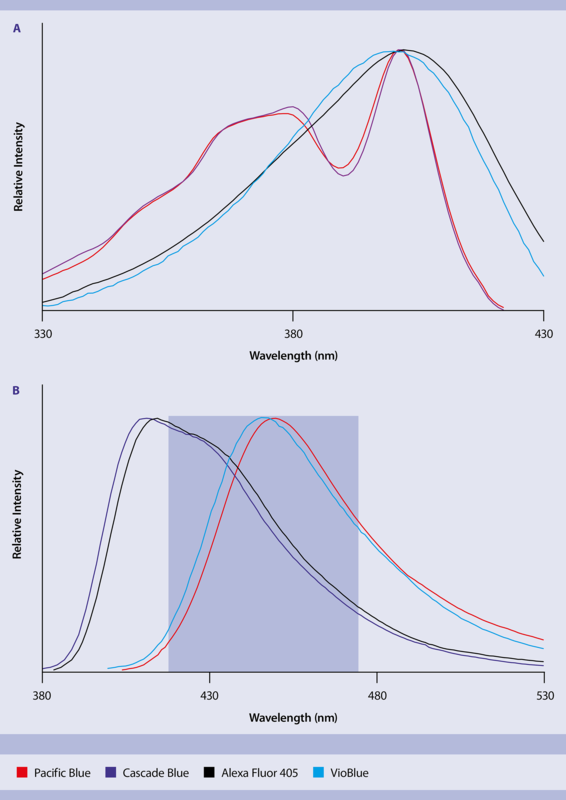 With a maximum absorption and emission at 400 nm and 455 nm, respectively, VioBlue Conjugates are fully compatible with standard filter sets from all major flow cytometry hardware providers, giving researchers the flexibility to use the VioBlue Dye with all existing platforms. 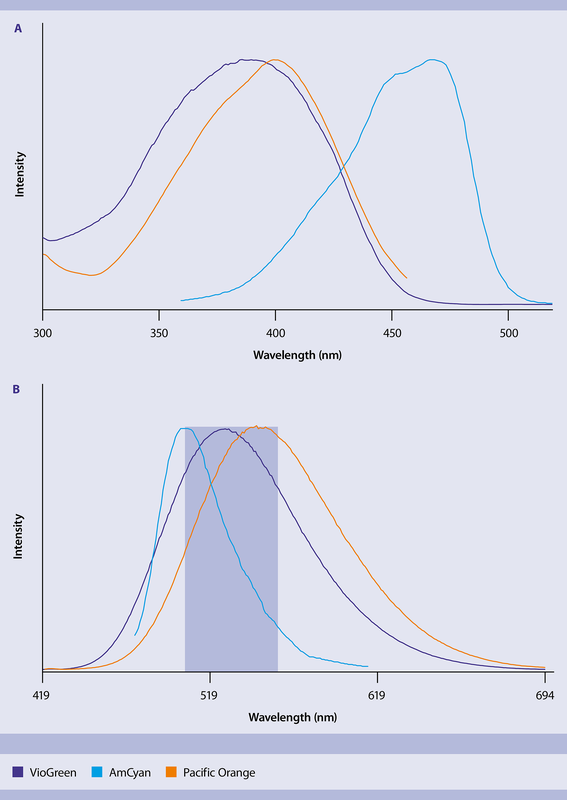 Absorption (top) and emission (bottom) spectra of VioBlue compared to Pacific Blue, Cascade Blue, and Alexa Fluor 405. The blue box represents the 450/50 nm filter. Compared to well-established fluorochromes with high fluorescence intensities, such as PE, VioBlue exhibits a similar degree of fluorescence. 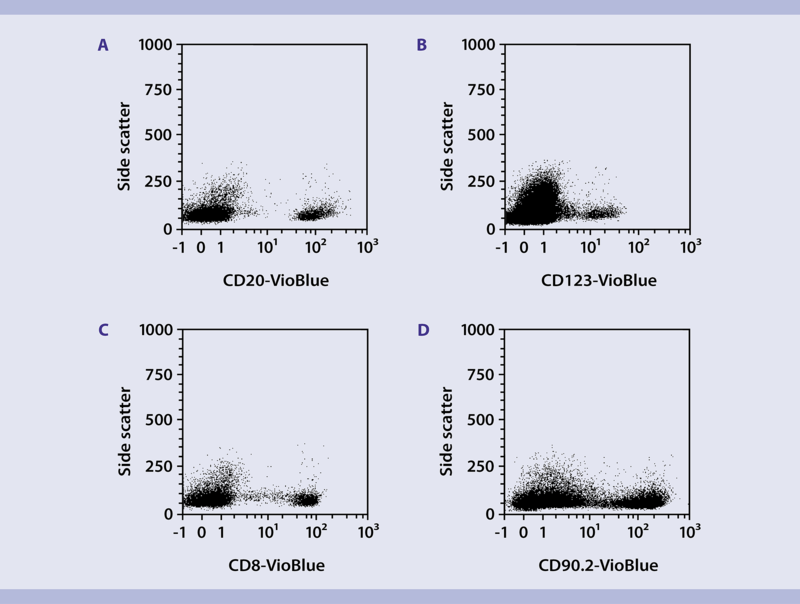 Human peripheral blood mononuclear cells (PBMCs) or mouse splenocytes (MS) were stained with CD20-VioBlue (A; PBMCs), the rare cell marker CD123‑VioBlue (B; PBMCs), CD8-VioBlue (C; PBMCs), or CD90.2-VioBlue (D; MS) and analyzed by flow cytometry using the MACSQuant® Analyzer. VioBlue Conjugates provide a superior alternative to many spectrally similar conjugates for the V1 channel, further increasing the options of multicolor analysis. Fluorescence intensity of cells labeled with CD14 antibodies conjugated to either VioBlue or Pacific Blue. VioBlue Conjugates exhibit minimal spillover into the V2 channel, making them perfect candidates for multicolor panels which utilize both violet channels. Furthermore, VioBlue is negligibly excited by the 488 nm laser, and thus requires no compensation between the V1 and B1 channels. It is of crucial importance for a conjugate to retain its fluorescent properties after fixation, in order to allow researchers to maximize the use of biological samples. The VioBlue Dye has a very high stability after fixation with paraformaldehyde, equal to or exceeding many other spectrally similar fluorochromes. CD123-VioBlue staining before (left) and after (right) fixation with 3.7% paraformaldehyde indicating only a very small decrease in fluorescence after fixation. The VioGreen™ Dye is a fluorochrome with a large Stokes shift, emitting strong fluorescence at 520 nm upon excitation at 405 nm. It is a non-protein fluorochrome with significantly increased mean fluorescence intensities and higher stain indices compared to related fluorochromes such as Pacific Orange™, Krome Orange™, and BD Horizon V500. Designed to maximize the potential of a flow cytometer’s violet laser, the VioGreen Dye shows superior performance compared with many other fluorochromes excited at 405 nm, including significant advances in brightness, signal-to-noise ratios, and intralaser compensation requirements. In addition, VioGreen exhibits minimal levels of photo-induced degradation, and can consequently be used for many different applications, such as fluorescence microscopy. 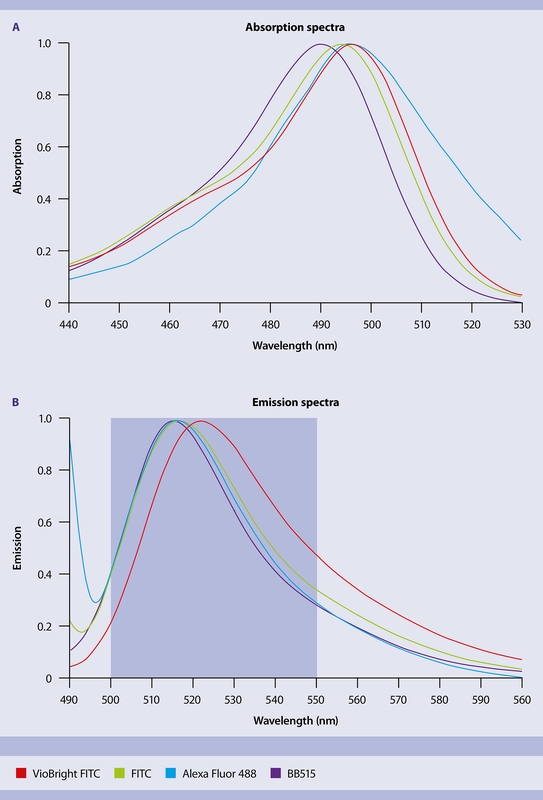 Absorption and emission maxima of fluorochromes related to VioGreen. With a standard 525/50 nm filter set, VioGreen exhibits a more favorable spectral profile than Pacific Orange or AmCyan. Absorption (top) and emission (bottom) spectra of VioGreen, Pacific Orange, and AmCyan. The blue box represents the 525/50 nm filter. Like most dyes designed for the violet laser, VioGreen shows a lower fluorescence intensity compared to other well-established fluorochromes, such as PE. However, human and mouse cell populations stained with a VioGreen-conjugated antibody can be easily identified and distinguished from unstained cells. 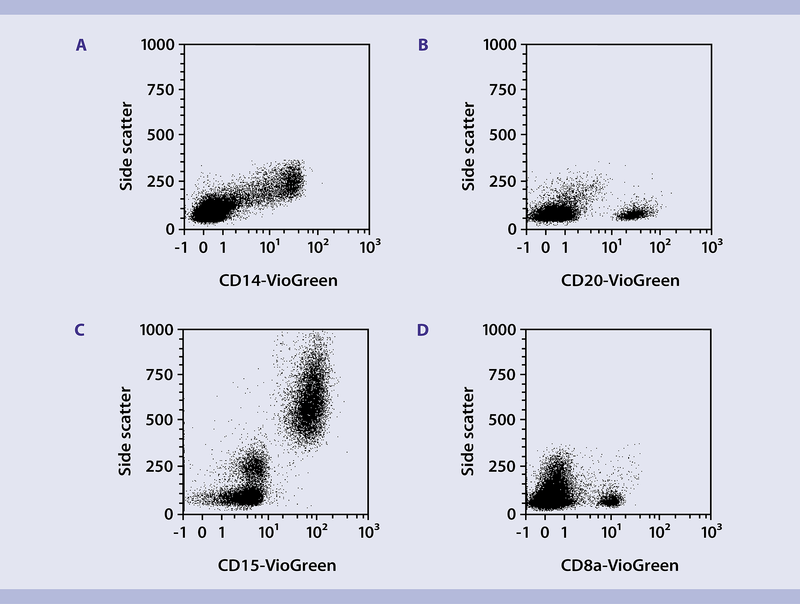 Human peripheral blood mononuclear cells (PBMCs) or mouse splenocytes (MS) were stained with CD14-VioGreen (A; PBMCs), CD20-VioGreen (B; PBMCs), CD15-VioGreen (C; PBMCs), or CD8a-VioGreen (D; MS) and analyzed by flow cytometry using the MACSQuant Analyzer. In addition, many VioGreen Conjugates exhibit brighter fluorescence compared to spectrally similar conjugates, including Pacific Orange, AmCyan, and Horizon V500, as measured by mean fluorescence intensity (MFI) or stain index (normalized signal-to-noise ratio). MFI and stain indices of CD8-VioGreen and CD8-Pacific Orange. Analysis of human PBMCs using CD3 antibodies conjugated to either VioGreen (purple), Horizon V500 (black), or Krome Orange (orange). The VioGreen Dye exhibits strong photostability during paraformaldehyde and ethanol fixation, with only minimal photo-induced degradation. This highlights the dye’s suitability for use in studies that require fixation. CD14-VioGreen staining before (left) and after (right) paraformaldehyde fixation, indicating only a very small decrease in fluorescence after fixation. VioBright™ 515 is an extraordinarily bright dye for the FITC channel. The proprietary multimerization technology allows a 4-fold increase in brightness over the traditional FITC dye. The fluorochrome is excited by the blue laser (488 nm) and its emission peak is at 514 nm. Improved brightness in combination with 25% less spillover into the PE channel enables optimal detection of rare surface markers in the FITC channel. Absorption and emission maxima of fluorochromes related to VioBright 515. VioBright 515 can be excited with a blue laser (488 nm) and displays peak excitation and emission at 488 nm and 514 nm, respectively. Its fluorescence signal can be detected with a standard FITC filter, such as the 525/50 nm filter of the MACSQuant Flow Cytometers. Thus, no changes in detection filters or the cytometer itself are required. With VioBright 515 the potential of the most commonly used laser-filter combination in flow cytometers can be extended to detect a wider variety of markers, including intracellular markers. Absorption (top) and emission (bottom) spectra of VioBright 515 compared to FITC, VioBright FITC, and Vio 515. VioBright 515 is the best choice for the detection of markers with low expression levels. With stain indices and mean fluorescent intensities (MFI) higher than those of PE, VioBright 515 staining allows for an excellent resolution of positive and negative cell populations. MFI and stain indices of CD56 antibodies conjugated to various fluorochromes. 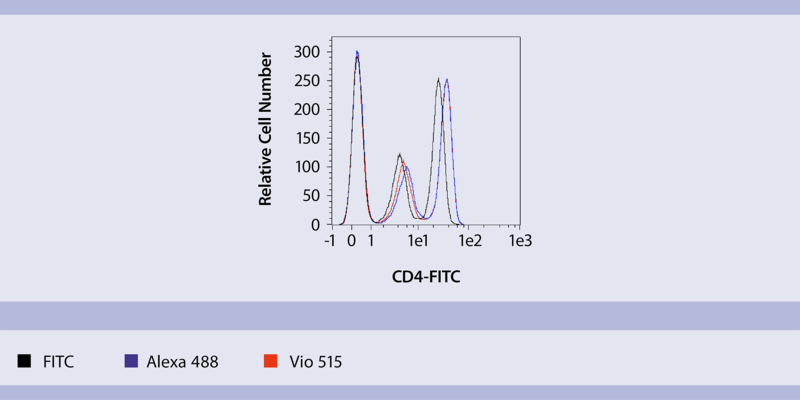 VioBright 515 is the optimal dye for the analysis of dim markers, such as CD56. In the example shown here, the CD56+CD3+ NKT cell population from whole blood could be analyzed more precisely (right dot plot) than with an alternative bright dye for the same channel (left dot plot). Human whole blood was stained with CD3-VioBlue (clone REA613) and (A) CD56-BB515 or (B) CD56-VioBright 515 (clone REA196). Bright fluorochromes, such as PE and APC, are often sensitive to fixatives. However, for successful flow cytometric analysis of intracellular markers, stability of the fluorochrome conjugates during fixation is essential. 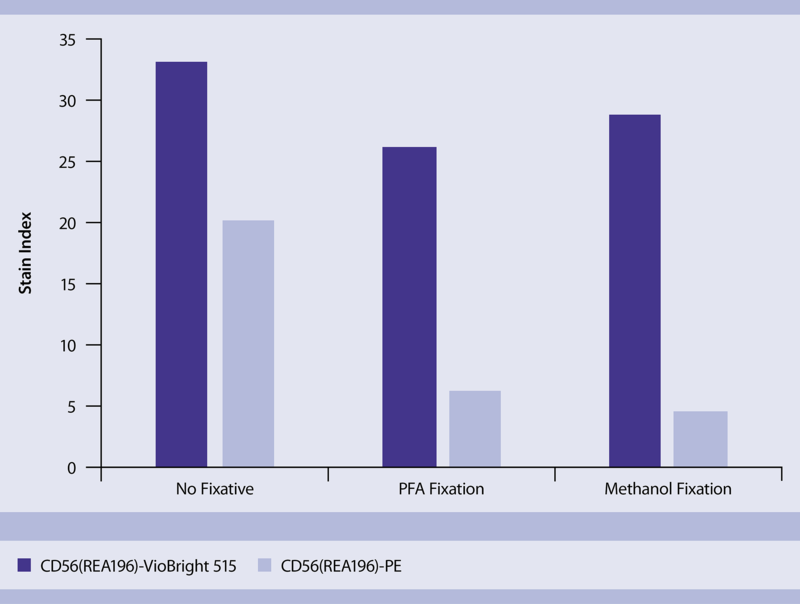 VioBright 515 conjugates show excellent stability towards methanol- and paraformaldehyde-based fixatives with only little compromise in brightness. Human PBMCs were stained using a CD56 antibody (clone REA196) conjugated to VioBright 515 or PE. Cells were analyzed by flow cytometry before and after fixation using paraformaldehyde (PFA) and 90% methanol. Analysis was performed using the MACSQuant Analyzer 10. Stability of CD56-VioBright 515 and CD56-PE towards fixation with PFA or methanol. The stability of VioBright 515 upon exposure to confocal laser light was analyzed at different time points on a Zeiss LSM710 confocal microscope. Compared to a FITC conjugate, significantly higher mean fluorescence intensities (MFI) were demonstrated for the VioBright 515–conjugated antibody at these time points. 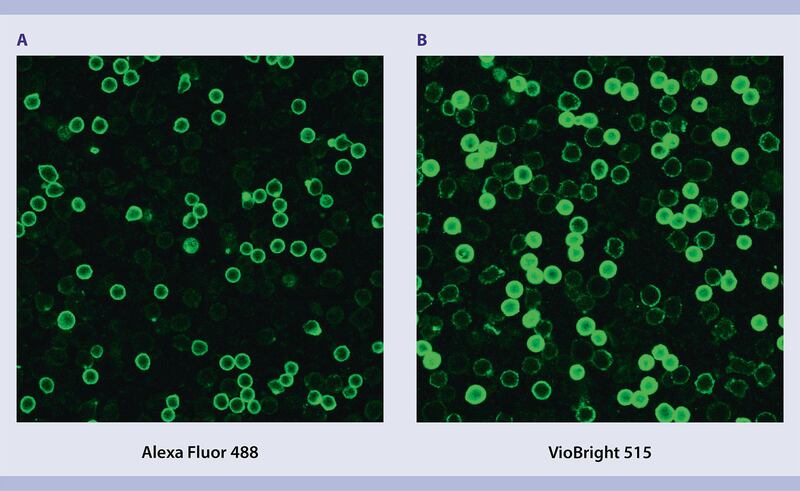 The VioBright 515 conjugate showed photostability comparable to the Alexa Fluor 488–conjugated antibody, indicating the excellent suitability of VioBright 515 for immunofluorescence microscopy. Human PBMCs were stained with CD4 antibodies conjugated to Alexa Fluor 488 (A) and VioBright 515 (B). Stained cell samples were fixed with paraformaldehyde for 20 min and transferred to a 96-well plate for analysis. Comparable photostability could be observed upon exposure to confocal laser light. The experiment was performed on a Zeiss LSM710 microscope. Human PBMCs were stained with CD4 antibodies conjugated to Alexa Fluor 488 (A) and VioBright 515 (B). Stained cell samples were fixed with p-formaldehyde for 20 min and transferred to a 96-well plate for analysis. Comparable photostability could be observed upon exposure to confocal laser light. The experiment was performed on a Zeiss LSM710 microscope. Human PBMCs were stained with fluorochrome-conjugated CD4 antibodies conjugated to FITC, Alexa Fluor 488, and VioBright 515. Stained cell samples were fixed with paraformaldehyde for 20 min and transferred to a 96-well plate for analysis. The plotted curve is normalized over multiple time points. Human PBMCs were stained with fluorochrome-conjugated CD4 antibodies conjugated to FITC, Alexa Fluor 488, and VioBright 515. Stained cell samples were fixed with p-formaldehyde for 20 min and transferred to a 96-well plate for analysis. The plotted curve is normalized over multiple time points. Vio® 515 is an organic small-molecule dye, designed for the B1/FITC channel. 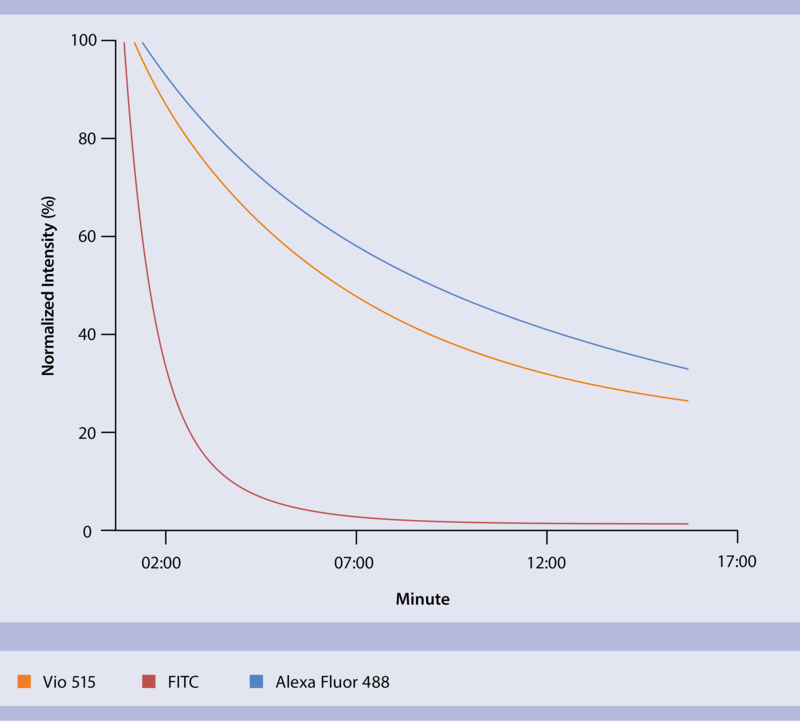 Compared to FITC, Vio 515 displays an improved brightness and allows the analysis of intracellular markers that were not accessible in this channel before. The dye thus provides more flexibility in multicolor panel design. Vio 515 shows 25% less spillover into the PE channel and facilitates optimal detection of intracellular markers, such as cytokines and transcription factors. The dye is excited by the blue laser (488 nm), and its emission peak is at 514 nm. Absorption and emission maxima of fluorochromes related to Vio 515. Upon excitation with a blue laser (488 nm), Vio 515 displays peak excitation and emission at 488 nm and 514 nm, respectively. Its fluorescent signal can be detected with a standard FITC filter, such as the 525/50 nm filter of the MACSQuant Instruments. Thus, no changes in detection filters or the flow cytometer itself are required. With Vio 515 the potential of the most commonly used laser-filter combination in flow cytometers can be extended to detect a wider variety of markers, including intracellular markers. 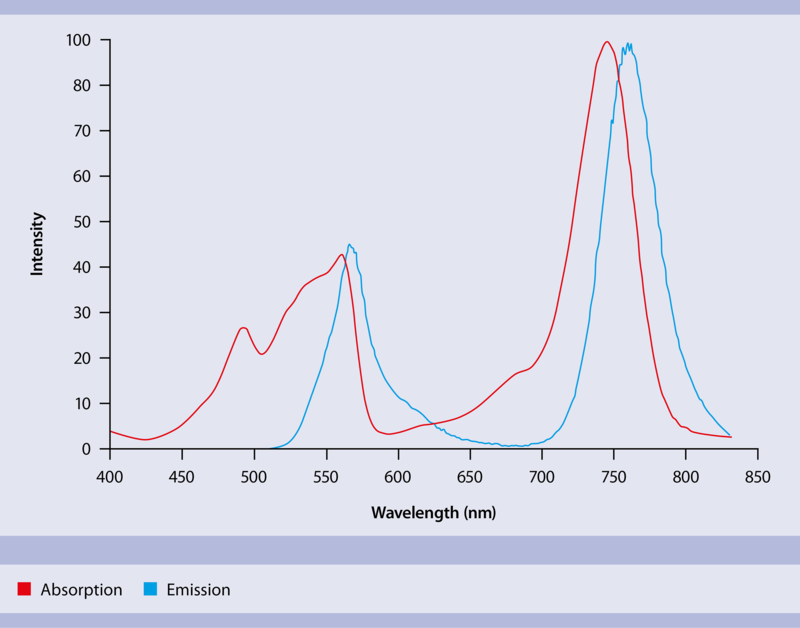 Absorption (top) and emission (bottom) spectra of Vio 515 compared to FITC, VioBright FITC, and VioBright 515. 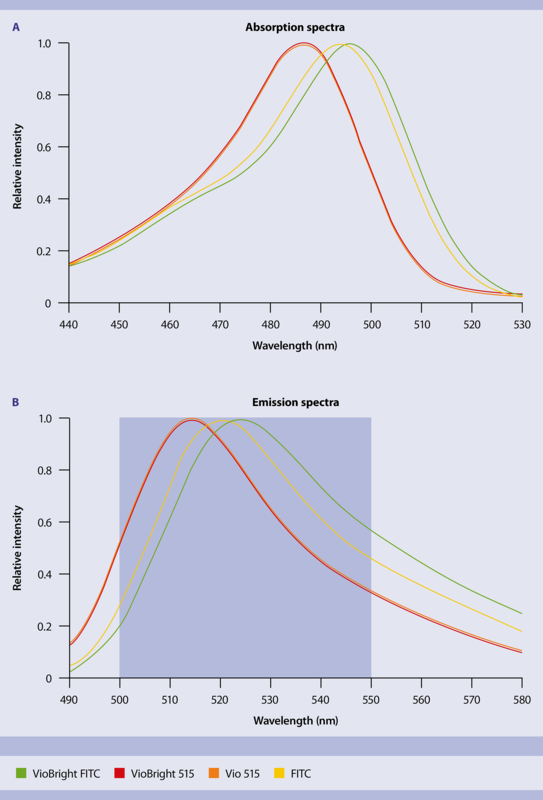 With stain indices and mean fluorescent intensities (MFI) higher than those of FITC, Vio 515 staining allows for an improved resolution of positive and negative populations as shown in the figure below. Human PBMCs were stained using CD4 (clone VIT4) antibodies conjugated to FITC, Vio 515, and Alexa Fluor 488. Samples were analyzed by flow cytometry using the MACSQuant Analyzer 10. MFI and stain indices of CD4 antibodies conjugated to various fluorochromes. Vio 515 is an optimal reagent for the analysis of intracellular markers such as cytokines. 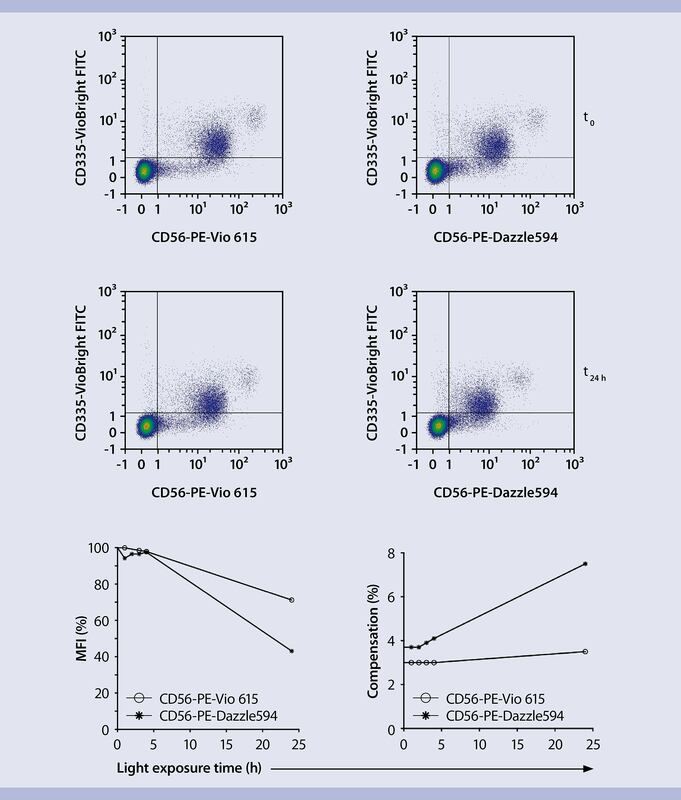 In this example of PFA-fixed human PBMCs, an Anti-IL-5-Vio 515 antibody enabled the detection of an IL-5–expressing CD4+CD69+ T cell subset. Human peripheral blood mononuclear cells (PBMCs) were either left unstimulated (A) or stimulated (B) with PMA/ionomycin for six hours. After two hours, brefeldin A was added. The cells were fixed, permeabilized, and intracellularly stained with Anti-IL-5 antibodies. Cells were then analyzed by flow cytometry. Plots show CD4+ lymphocytes gated according to CD4-APC staining. The stability of Vio 515 upon exposure to confocal laser light was analyzed at different time points on a Zeiss LSM710 confocal microscope. Vio 515 shows photostability comparable to Alexa Fluor 488, indicating an excellent suitability for immunofluorescence microscopy. Human PBMCs were stained with CD4 antibodies conjugated to Alexa Fluor 488 (A) and Vio 515 (B). Stained cell samples were fixed with p-formaldehyde for 20 min and transferred to a 96-well plate for analysis. Comparable photostability could be observed upon exposure to confocal laser light on a Zeiss LSM710 microscope. Vio 515 displayed a significantly higher mean fluorescence intensity (MFI) than FITC at different time points. Human PBMCs were stained with different fluorochrome-conjugated CD4 antibodies. Stained cell samples were fixed with paraformaldehyde for 20 min and transferred to a 96-well plate for analysis. The plotted curve is normalized over multiple time points. VioBright™ FITC is excited by a blue laser (488 nm). The VioBright Technology allows for an increased number of conjugated FITC molecules per antibody, compared to conventional FITC conjugation. With a brightness similar to PE, VioBright FITC expands the options of multicolor flow cytometry. In addition, it provides a bright alternative for confident detection of rare cells, as well as dim and uncharacterized markers. Absorption and emission maxima of fluorochromes related to VioBright FITC. Upon excitation with a blue laser (488 nm), VioBright FITC displays peak absorption and emission at 496 nm and 522 nm, respectively. Its high-intensity fluorescent signal can be detected using a standard FITC filter, such as the 525/50 nm filter of MACSQuant Instruments. Thus, no changes in detection filters or the flow cytometer itself are required when using VioBright FITC instead of FITC or other related fluorochromes. Along with PE, VioBright FITC increases the potential of the blue laser, one of the most common laser lines available for single- or multilaser instruments. 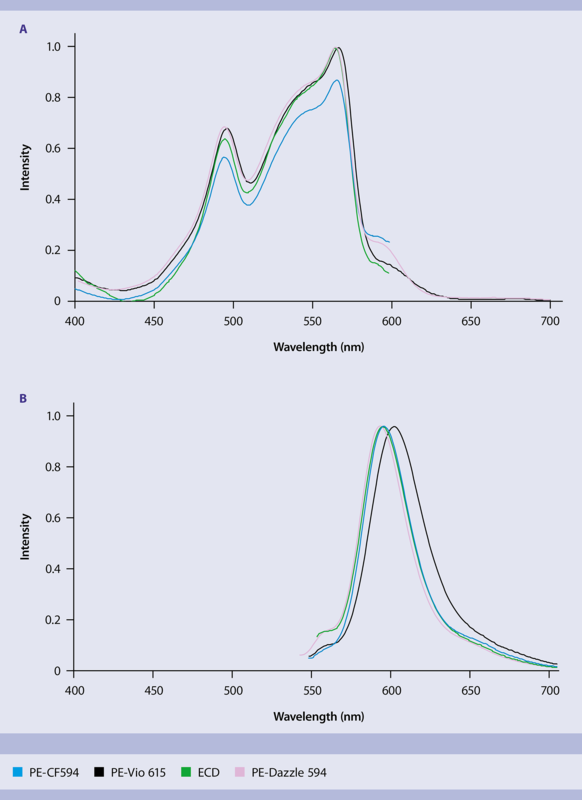 Absorption (top) and emission (bottom) spectra of VioBright FITC compared to FITC, Alexa Fluor 488, and BD Horizon Brilliant Blue 515 (BB515). VioBright FITC is a superior choice for the detection of markers with low expression levels. With stain indices and mean fluorescence intensities similar to PE, VioBright FITC staining allows for an excellent resolution of positive and negative cell populations. 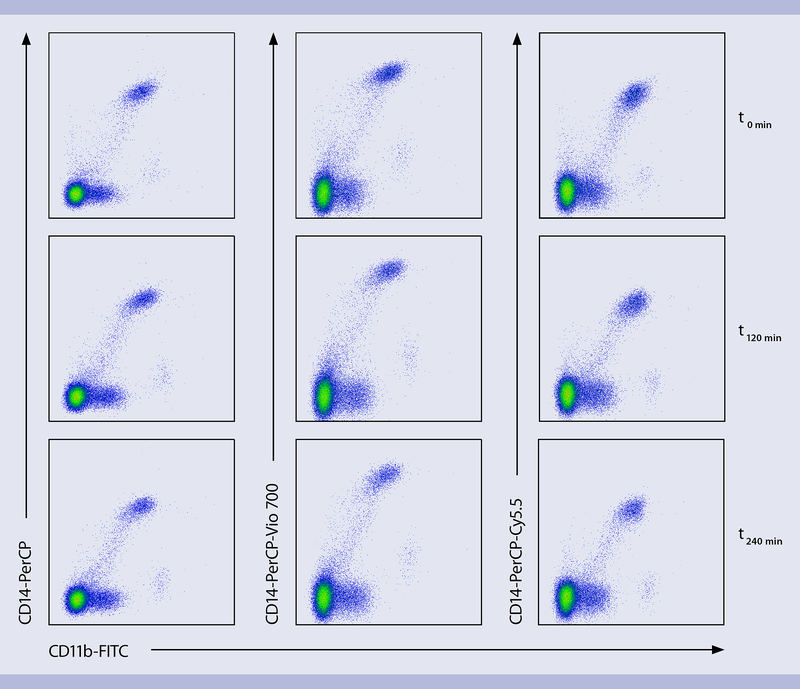 Detection of CD25+ cells using VioBright FITC–conjugated antibodies. 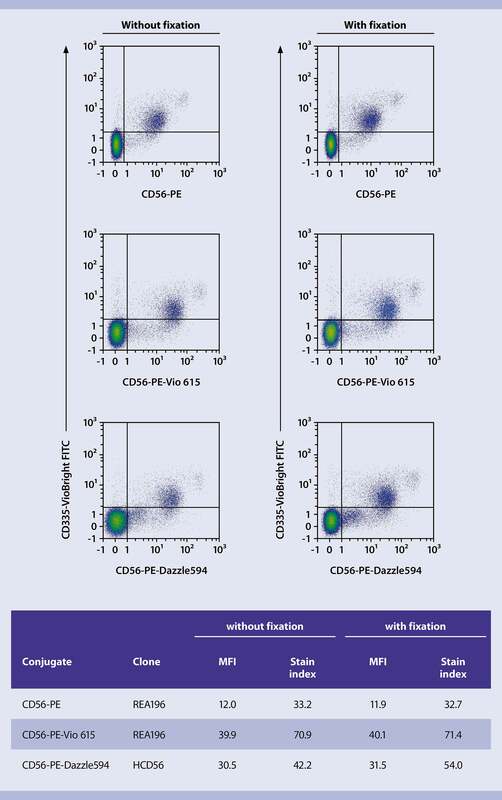 Detection of CD335+ cells using VioBright FITC–conjugated antibodies. Reliable analysis of rare cell types requires the specific identification of cellular subsets with low frequencies and a clear resolution of the target population. Thus, highly specific antibodies together with bright conjugates are essential for detection of such rare cell populations. VioBright FITC is an exceptionally bright dye for optimal detection of cell subpopulations and their detailed phenotypic analysis. 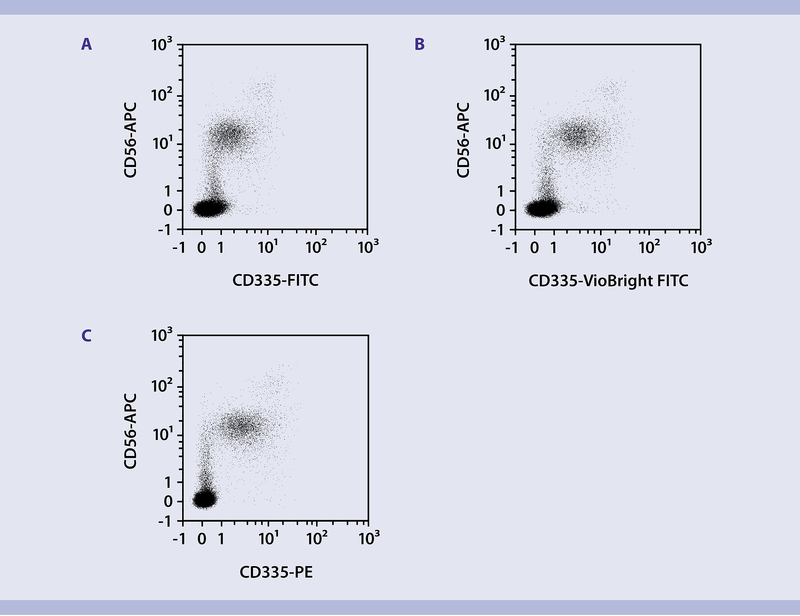 Detection of CD133/1+ cells using VioBright FITC–conjugated antibodies. MFI and stain indices of CD25 (clone 4E3), CD335 (clone 9E2), and CD133/1 (clone AC133) antibodies conjugated to either VioBright FITC or PE. 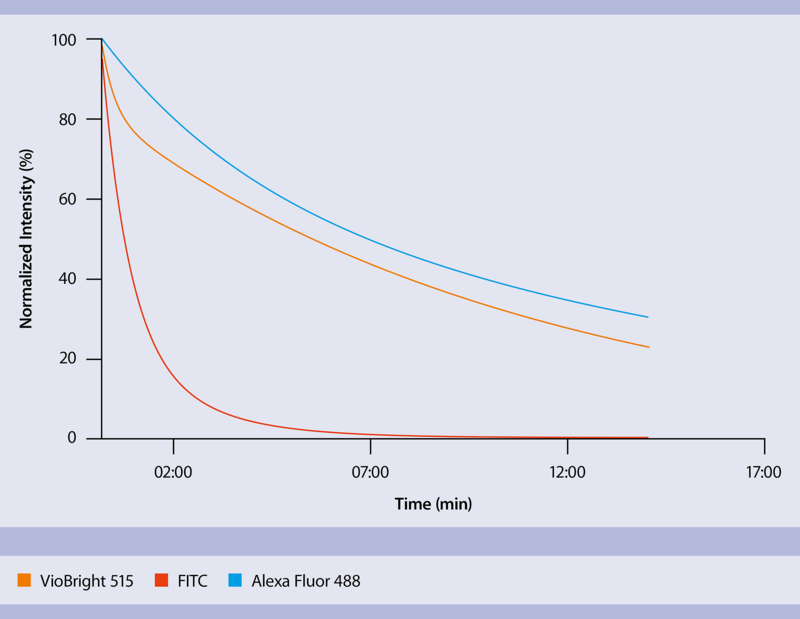 Compared to standard FITC, VioBright FITC displays only a minor increase in spillover into the PE channel. Thus, with a miniminal change in compensation settings, VioBright FITC provides the benefit of a brighter dye. PE-Vio® 615 is a tandem dye with PE as the donor and Vio 615 as the acceptor dye. PE-Vio 615 is optimized for efficient donor-to-acceptor energy transfer, high fluorescence intensity, and low spillover into the detection channel of the donor dye. Designed to be a superior alternative to ECD, PE-Texas Red, PE-eFluor 610, PE-CF594, and PE/Dazzle 594, this Vio Dye expands the options for flexible multicolor panel design and provides a bright dye for confident detection of dim and rare markers. Absorption and emission maxima of fluorochromes related to PE-Vio 615. The PE molecule shows peak absorption at two wavelengths, 496 nm and 565 nm. This allows for optimal excitation of PE-containing tandem dyes, such as PE-Vio 615, by blue, green, and yellow laser lines (488–561 nm). Absorption at 565 nm is greater than at 496 nm. Therefore, maximum excitation of PE-Vio 615 is achieved with instruments such as the MACSQuant VYB, which uses yellow laser lines for excitation of PE and PE-containing tandem dyes. The emission signal can be detected using typical filters designed for PE-Texas Red, such as a 615/20 nm filter. Absorption (A) and emission (B) spectra of PE-Vio 615. 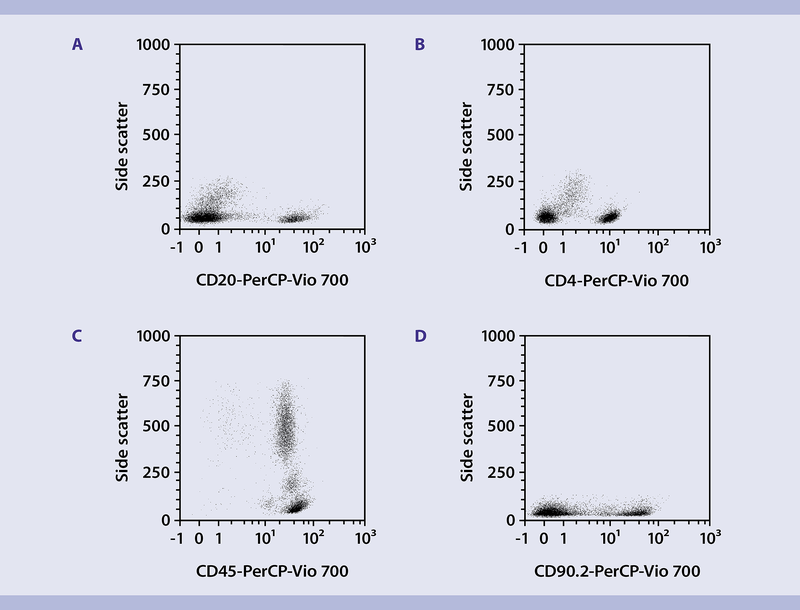 Human PBMCs were stained using CD4 antibodies (clone VIT4) conjugated to PE-Vio 615 and analyzed using a MACSQuant VYB (A) and MACSQuant Analyzer (B). PE-Vio 615 is designed to offer a bright alternative to dyes such as PE-eFluor 610, PE-CF594, ECD, and PE/Dazzle 594. Human PBMCs were stained using CD4 antibodies conjugated to PE-eFluor 610, PE-CF594, PE-Vio 615, ECD, and PE-Dazzle 594 and analyzed by flow cytometry using the MACSQuant VYB. 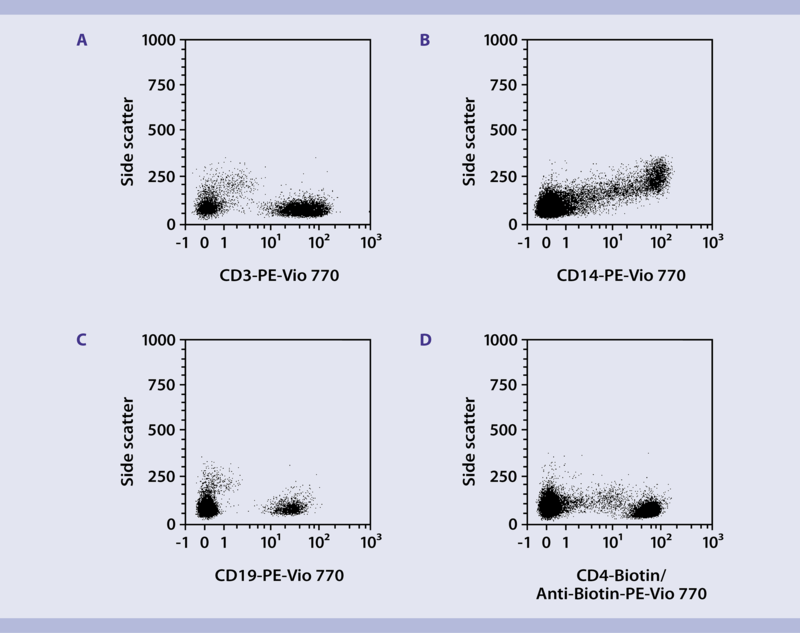 MFI and stain indices of CD4 antibodies conjugated to PE-Vio 615, ECD, PE-CF594, PE-eFluor 610, and PE/Dazzle 594. PE-Vio 615 allows for high fluorescent intensities and stain indices, enabling excellent distinction between positive and negative cell populations. This makes PE-Vio 615 an optimal dye for the analysis of dim markers and markers that are difficult to characterize. Human PBMCs were stained using CD56 antibodies (clone REA196) conjugated to either PE-Vio 615 or PE. Cells were also labeled with a CD335-VioBright FITC antibody and then analyzed by flow cytometry using the MACSQuant VYB. Human PBMCs were stained using a CD335-VioBright FITC antibody and CD56 antibodies (clone REA196) conjugated to either PE-Vio 615 or PE. Stained cells were then analyzed by flow cytometry using the MACSQuant VYB. PBMCs were stimulated for 6 hours. After 2 hours, 1 μg/mL BrefeldinA was added for the remaining 4 hours. Cells were stained extracellularly with CD4-FITC, fixed, permeabilized with the Inside Stain Kit (Miltenyi Biotec), and stained intracellularly with CD154-VioBlue and Anti-IL-4-PE or Anti-IL-4-PE-Vio 615 (clone: 7A3-3) for subsequent flow cytometry analysis. Cells were gated on CD4+ lymphocytes. Numbers indicate cell frequencies among CD4+ cells. Data courtesy of Petra Bacher, Clinic for Rheumatology and Clinical Immunology, Charité – University Medicine Berlin, Berlin, Germany. Tandem conjugates are often sensitive to fixatives. However, for many flow cytometric analyses requiring prior fixation, stability of tandem conjugates is critical. PE-Vio 615 shows excellent stability to paraformaldehyde fixation without any increase in background signal. Human PBMCs were stained using CD56 antibodies (clone REA196) conjugated to PE, PE-Vio 615, or PE-Dazzle 594. In addition, cells were stained with CD335-VioBright FITC and analyzed before and after fixation using paraformaldehyde. Stained cells were analyzed by flow cytometry. The stability of PE-Vio 615 upon exposure to ambient light was analyzed at different time points. PE-Vio 615 showed significantly higher mean fluorescence intensities (MFI) and stain indices at these time points than commercially available alternatives. Human PBMCs were stained with CD56 antibodies conjugated to PE-Vio 615 (clone REA196) or PE-Dazzle 594 (clone HCD56). Stained cells were then exposed to ambient light (~850 lux) and analyzed at different time points by flow cytometry using the MACSQuant VYB. Spillover into the Y1 channel, which is optimized for detection of the PE signal, was also analyzed after exposure to light. PerCP-Vio® 700 is a tandem conjugate that combines the peridinin chlorophyll protein (PerCP) and the Vio 700 dye to emit strong fluorescence at 655–730 nm upon excitation with a blue laser at 488 nm. This dye is suited perfectly for the B3 channel of the MACSQuant Analyzer. Absorption and emission maxima of fluorochromes related to PerCP-Vio 700. When used in combination with a standard 655–730 nm bandpass filter, PerCP-Vio 700 exhibits a very narrow emission spectrum profile, thus allowing the majority of light to be captured and retained. Absorption and emission spectra of PerCP-Vio 700. The blue box represents the 655–730 nm filter. Absorption and emission spectra of PerCP-Vio700. The blue box represents the 655–730 filter. Human peripheral blood mononuclear cells and mouse splenocytes were stained with various antibodies conjugated to PerCP-Vio 700. Excellent distinction between positive and negative cell populations was observed for many different antibody specificities. Human peripheral blood mononuclear cells (PBMCs) or mouse splenocytes (MS) were stained with CD20-PerCP-Vio 700 (A; PBMCs), CD4-PerCP-Vio 700 (B; PBMCs), CD45-PerCP-Vio 700 (C; PBMCs) or CD90.2-PerCP-Vio 700 (D; MS) and analyzed by flow cytometry using the MACSQuant Analyzer. PerCP-Vio 700 shows excellent stability towards fixatives, with only minimal decrease in fluorescence after fixation. CD8-PerCP-Vio 700 before (A) and after (B) incubation with 3.7% paraformaldehyde, indicating only a minimal decrease in fluorescence after fixation. CD8-PerCP-Vio 700 before (A) and after (B) incubation with 3.7% paraformaldehyde, indicating a minimal decrease in fluorescence after fixation. Analysis of the photostability of CD14-PerCP-Vio 700 indicated no discernable changes after up to four hours of continuous exposure to ambient light (~850 lux). PerCP-Vio 700 showed significantly higher mean fluorescence intensities (MFI) and stain indices at these time points than commercially available alternatives. Antibodies conjugated to PerCP, PerCP‑Vio 700, and PerCP-Cy 5.5 were exposed to ambient light for up to four hours and showed excellent photostability over this time course. PE-Vio® 770 is a tandem conjugate, like PE-Cy7, which is based on the principle of fluorescence resonance energy transfer (FRET) allowing for large Stokes shifts between the absorbed energy of a fluorescence donor (PE) and the emission wavelength of a suitable acceptor (Vio 770) dye. Absorption and emission maxima of fluorochromes related to PE-Vio 770. The tandem dyes PE-Vio 770, PE-Cy7, and PE-Alexa Fluor 750 all use PE as the donor molecule, showing absorption at 495 nm and, to a greater extent, at 567 nm. Consequently, the MACSQuant VYB, equipped with a yellow 561 nm laser, is best suited to provide maximum excitation of the PE molecules, which in turn transfer this energy to the respective acceptor molecule. Vio 770 shows emission properties similar to Cy7 and Alexa Fluor 750. Absorption and emission spectra of PE-Vio 770. Absorption and emission spectra of PE-Vio770. PE-Vio 770 provides the greatest fluorescence intensity of the Vio Dye family, with excellent distinction between positive and negative cells. Human peripheral blood mononuclear cells (PBMC) or mouse splenocytes (MS) were stained with CD3-PE-Vio 770 (A; PBMCs), CD14-PE-Vio 770 (B; PBMCs), CD19-PE-Vio 770 (C; PBMCs), or CD4-Biotin/Anti-Biotin-PE-Vio 770 (D; MS) and analyzed by flow cytometry using the MACSQuant Analyzer. Compared to other spectrally similar tandem conjugates, such as PE-Cy7 or PE-Alexa Fluor 750, PE-Vio 770 exhibits significantly higher mean fluorescence intensities (MFI) and stain indices, and requires less compensation. These properties make PE-Vio 770 a superior tandem conjugate compared to PE-Cy7 or PE-Alexa Fluor 750. Analysis of human PBMCs using CD8 antibodies (clone BW135/80) conjugated to either PE-Vio 770 or PE-Cy7. Concurrent staining with CD14-PerCP and CD56-PE was performed to exclude CD14+ and CD56+ cells from the analysis. MFI, stain indices, and compensation requirements of CD8-PE-Vio 770 and CD8-PE-Cy7. Tandem conjugates are usually less stable after fixation than single-absorption/emission fluorochromes. However, PE-Vio 770 shows excellent stability as shown below. CD45RA-PE-Vio 770 fluorescence before (A) and after (B) paraformaldehyde fixation. MFIs with and without fixation amounted to 124 and 139, respectively, resulting in a decrease in fluorescence of only 11% after fixation. Absorption (A) and emission (B) spectra of PE-Vio 615 and related fluorochromes. Human PBMCs were stained using CD56 antibodies (clone REA196) conjugated to either PE-Vio 615 or PE and CD335-VioBright FITC. Stained cells were then analyzed by flow cytometry using the MACSQuant VYB. Human PBMCs were stained with CD56 antibodies conjugated to PE-Vio 615 (clone REA196) or PE-Dazzle594 (clone HCD56). Stained cells were then exposed to ambient light (~850 lux) and analyzed at different time points by flow cytometry using the MACSQuant VYB. Spillover into the Y1 channel, which is optimized for detection of the PE signal, was also analyzed after exposure to light. The tandem dyes PE-Vio 770, PE-Cy7, and PE-Alexa Fluor 750 all use PE as the donor molecule, showing absorption at 495 nm and, to a greater extent, at 567 nm. Consequently, the MACSQuant VYB, equipped with a yellow 561 nm laser, is best suited to provide maximum excitation of the PE molecules, which in turn transfer this energy to the respective acceptor molecule. Vio 770 shows emission properties similar to Cy7, and Alexa Fluor 750. Compared to other spectrally similar tandem conjugates, such as PE-Cy7 or PE-Alexa Fluor 750, PE-Vio 770 exhibits significantly higher mean fluorescence intensities (MFI) and stain indices, and requires less compensation. These properties make PE-Vio 770 a far superior tandem conjugate compared to PE-Cy7 or PE-Alexa Fluor 750. APC-Vio® 770 dye is a tandem conjugate, like APC-Cy7 or APC-H7, which is based on the principle of fluorescence resonance energy transfer (FRET) allowing for large Stokes shifts between the absorbed energy of a fluorescence donor (APC) and the emission wavelength of a suitable acceptor (Vio 770). Absorption and emission maxima of fluorochromes related to APC-Vio 770. The tandem dyes APC-Vio 770, APC-Cy7, and APC-H7 all use APC as the donor fluorochrome, showing maximum absorption around 652 nm. 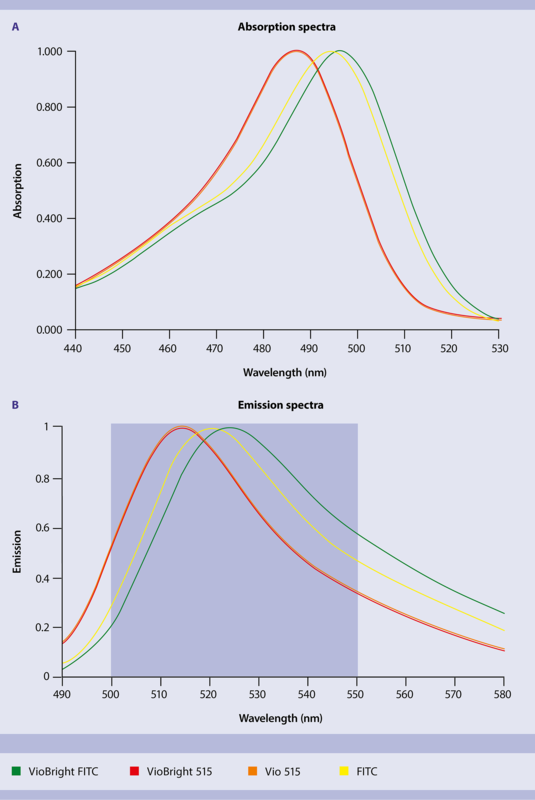 Emission spectra for Vio 770, Cy7, H7, and Alexa Fluor 750 are similar. Therefore, APC-Vio 770 is an ideal tandem conjugate for this channel in all flow cytometers. Absorption and emission spectra of APC-Vio 770. 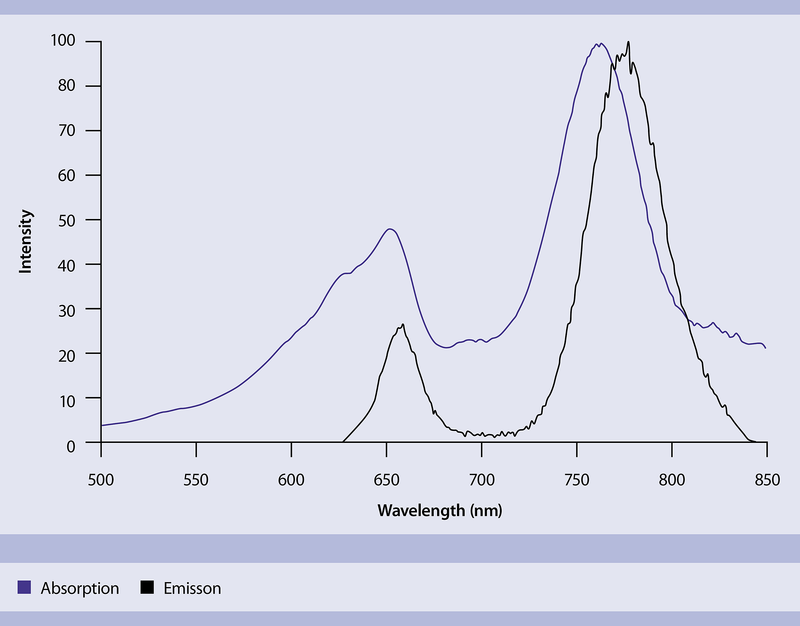 Absorption and emission spectra of APC-Vio770. APC-Vio 770 provides strong staining, allowing the identification and analysis of specific cell populations . The strong staining pattern of APC-Vio 770 is illustrated by comparing unstained (left), CD16-APC-stained (middle), and CD16-APC-Vio 770-stained (right) cellular material, after gating on leukocytes and dead cell exclusion. The strong staining pattern of APC-Vio 770 can be illustrated by comparing unstained (left), CD16-APC-stained (middle), and CD16-APC-Vio 770-stained (right) cellular material, after gating on leukocytes and dead cell exclusion. Compared to other spectrally similar conjugates, such as APC-Cy7 and APC-H7, APC-Vio 770 exhibits equal or stronger staining patterns. In addition, APC-Vio 770 generally shows higher mean fluorescence intensities (MFI) and greater stain index values, and requires less compensation in the R1 channel than both APC-Cy7 and APC-H7. These properties make APC-Vio 770 an ideal fluorochrome for use in the R2 channel. Analysis of human PBMCs using CD8 antibodies (clone BW135/80) conjugated to APC-Vio 770, APC-Cy7, or APC-H7. Concurrent staining with CD14-PerCP and CD56-PE was performed to exclude CD14+ and CD56+ cells from the analysis. MFI, stain indices, and compensation requirements of CD8-APC-Vio 770, CD8-APC-Cy7, and CD8-APC-H7. APC-Vio 770 shows excellent stability after fixation with paraformaldehyde, similar to PE-Vio 770. Cells were stained with CD45-APC-Vio 770 and left untreated (left) or fixed with paraformaldehyde (right). MFIs with and without fixation amounted to 62 and 68, respectively, resulting in a decrease in fluorescence of only 8% after fixation.